While this is still a relatively new area in urban design in Australia and research is ongoing, green solutions for skinning your building are becoming increasingly popular because their widespread benefits are worth shouting from the rooftops! The potential for green facades to improve the microclimate, including reducing the heat island effect (temperatures in cities going up because of an increase in hard reflective surfaces), is well known because of the increased plant life being introduced to the environment. Our green solutions involve providing the right size stainless steel cable and trellis for skinning your building whether it’s a small job or a large commercial project. Similarly, you will need the right design advice on trellis planning and what the recommended loads will be. Plus, you’ll want details on easy to assemble cables. In relation to the heat island effect a study on the effect on the interior air temperature of a building with a green skin found that the greatest cooling from the green facade on interior air temperature was from 3pm to 9pm during the three hottest months of June to August. The non-air-conditioned, but insulated experimental buildings without green facades (that is, bare walls) had indoor temperatures of 33⁰C during this time of day, while the buildings with green facades (for example, green walls) had a mean temperature of 29⁰C. 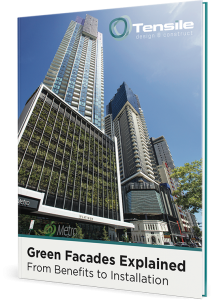 Equally, the effect on exterior wall temperature by the green facades reduced the mean peak in exterior wall temperature by more than 12⁰C during June, July and August, which was a reduction from 46⁰C on bare walls to 34⁰C on the green walls. It’s been shown that green solutions on building facades clearly reduce heat flux into the building’s exterior walls. Thus, a green solution for skinning your building’s ultimate mechanism for reducing indoor temperatures is to keep exterior wall temperatures cooler. To find out more about living systems and green façades check out our projects here.